Today is World Sparrow Day. I had never heard of this day before, but it has been around since 2010, according to websites I’ve seen. The day is set aside to celebrate and raise awareness of the decline of the house sparrow. I’m sure many of you (I know I did) immediately questioned that house sparrows are in decline. They are ubiquitous in many areas and so numerous to be considered a pest in others. But, according to many sites posting about World Sparrow Day, the familiar bird is indeed in decline throughout much of its global range. I’ve been critical of house sparrows in the past and have complained of them “hogging” the birdfeeder perches, but I certainly do not wish a precipitous global decline of the species. I’ve read enough about the passenger pigeon to know that no species is safe regardless of their current population. So I read further on the matter of the house sparrow. It’s always good to get ahead of a problem before it’s too late, which is what the National Forever Society is doing with World Sparrow Day. Much more information is available at www.worldsparrowday.org. Take a look and make your own decisions about the state of the house sparrow. The term “sparrow” is very broad and includes many bird species. In the U.S., we have “Old World Sparrows” and “New World Sparrows.” House sparrows, which are not native to North America, are Old World Sparrows and pretty much every other sparrow we see in New England is a New World Sparrow. Here are some photos of New World Sparrows we see in New England. A White-throated Sparrow perches on a branch in Stamford, Conn., March 2015. Photo by Chris Bosak A song sparrow eats berries at Dolce Center in Norwalk, Conn.
A Swamp Sparrow perches on a branch at Cove Island Wildlife Sanctuary, fall 2014. An American Tree Sparrow perches near a feeding station during the snowstorm of Feb. 13, 2014. A Dark-eyed Junco eats a sunflower seed the day following a snowstorm in New England, Jan. 2016. Here’s my latest For the Birds column, which ran last Thursday in The Hour (Norwalk, CT) and Monday in The Keene (N.H.) Sentinel. 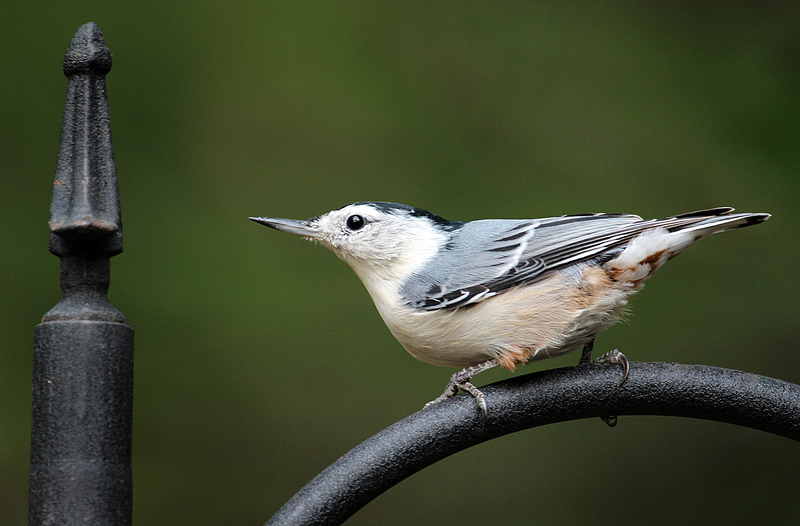 White-breasted Nuthatches are a common feeder bird in New England. What will $18 get you these days? About eight gallons of gasoline. Way better than the five gallons it used to get you. Three bundles of the firewood stacked at the entrance of every grocery store, convenience store and hardware store these days. The bundles are each good for about 10 minutes in a firepit. Two and a half craft beers at just about any bar or restaurant. Oops, forgot about the tip. Make that two beers. Or, $18 covers your entrance fee to participate in Project FeederWatch, a citizen science project of The Cornell Lab of Ornithology and Bird Studies Canada. It entails keeping track of the birds you see at your backyard feeding stations and submitting your results online. The data collected helps scientists track bird populations in the winter — similar to the Christmas Bird Count and Great Backyard Bird Count. The fee also gets you a bird ID poster, birdwatching calendar, instruction sheet and newsletter. No guarantee here that the materials will not have images of snowflakes. Try not to be offended if they do. Project FeederWatch officially started this past Saturday and runs through early April. Don’t worry if you missed the opening day, you can join in whenever. Participants can count the birds as much or as little as they’d like — 24/7 monitoring is not necessary. Being an expert birdwatcher is not required either. All skill levels welcome. Why not get the entire family involved? Old and young. The feeders at my new place are always bustling with the common visitors White-breasted Nuthatches, Black-capped Chickadees, Tufted Titmice and Downy Woodpeckers. I also see Carolina Wrens, Blue Jays, Hairy Woodpeckers, Red-bellied Woodpeckers and American Goldfinches. Lately I’ve noticed a few Dark-eyed Juncos under the feeders. The White-throated Sparrows are not far behind, I’m sure. Will my Pine Warblers I had earlier this fall return to the suet cake? Probably not, but I’ll be watching. Who knows what else will show up? To join the Project or to get more information, visit http://www.feederwatch.org. The website is full of information and tips on identifying birds (including tricky IDs), feeding birds tips, trend maps, and historical data. So why participate other than it “helps scientists?” Many bird species are in decline, some seriously so. Tracking the winter abundance and distribution of birds with long-term data offers valuable insight into their lives. It helps scientists track gradual population shifts of bird species. WE know the Carolina Wren and Red-bellied Woodpecker are trending northward. This data quantifies the movement. That’s more of a positive population shift. What about the negative one? What about the species that are declining year after year? The data helps scientists recognize the decline and figure out solutions more quickly. Let me know if join and what birds you see at your feeders. It’s that time of year again. Warblers abound. 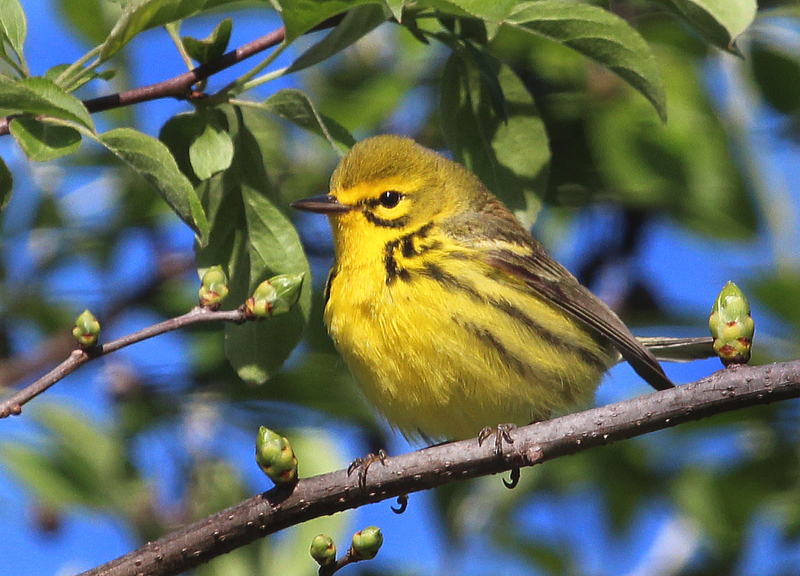 A Prairie Warbler perches in a tree at Selleck’s/Dunlap Woods on May 5, 2014. I took a quick walk before work this morning. As usual, I was running behind getting my third-grader to school, so I had only about 15 minutes for this walk. But it was enough to know that we are in what many birders consider the most exciting two weeks of the year. The warbler migration started with a trickle a few weeks ago in New England. Based on what I saw on my quick walk this morning, the warbler season is picking up fast. A Prairie Warbler was the first bird I saw — not a bad start to a walk. A few Yellow Warblers darted here and there, too. Yellow Warblers nest at Selleck’s Woods, so hopefully they are looking to set up shop for the summer. The walk included a few other warbler species as well as the sounds of other colorful songbirds, such as Baltimore Orioles and Blue-gray Gnatcatchers. It’s a great time to be out there. Let me know what you are seeing. Here’s a post from last year featuring some of the warblers you may see out there this time of year. Click here. 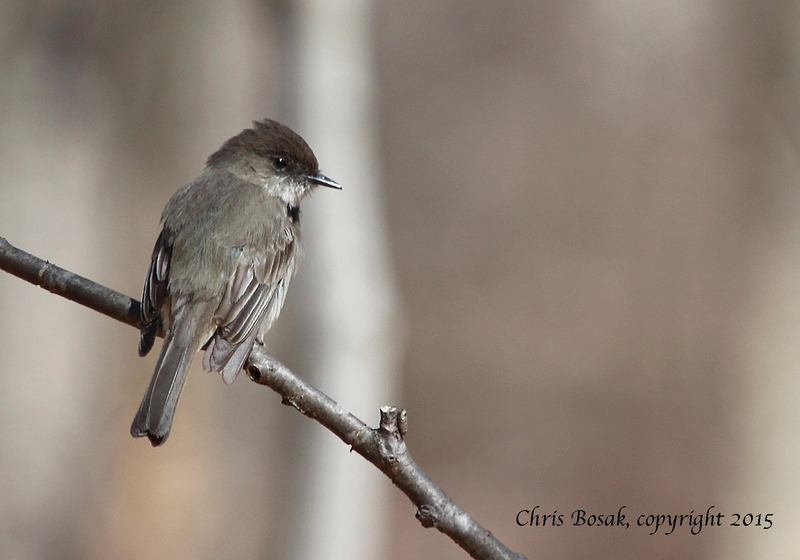 An Eastern Phoebe perches on a branch in Selleck’s Woods in Darien, Conn., in late March 2015. A very quiet walk in a patch of woods the other day suddenly turned interesting when a lone Eastern Phoebe made an appearance. Overall, the phoebe is somewhat drab, but its habit of bobbing its tail constantly gives its identity away immediately. I’ve always liked phoebes despite their nondescript appearance and quiet voice. Perhaps it’s because they migrate so early and offer some hope that winter is finally in the rearview mirror. I’ve been seeing them almost daily now, so it’s nice to know spring is here. Phoebes, just like chickadees and several birds, are named after the song they sing.